We met it the cancer treatment unit of St.Vincent’s Medical Center in Santa Fe. My colorful robe, the only colorful robe in a treatment waiting room filled with patients in gray robes, is what attracted him to me. “Why would I wear one of those?” I returned. His boisterous laughter sparked the gloomy room with light. “You mean, we don’t have to wear these hideous things?” he asked. The Beach Boys hit song “California Girls” — my 1965 anthem — instantly replayed in my mind on that icy cold February day in 2004. I was far from my California birthplace, and long removed by the days of cocoa-butter slathered teenage skin. The next day, wrapped in a brand new, full length designer robe, Edward Parone strolled down the long hospital corridor singing a Broadway hit tune. I laughed out loud. The other patients gasped, unsure if they should be amused or shocked. Eddie, as I called him, and I became best friends. We chatted like school kids about our lives, he withholding much of who he was. It wasn’t until he said, “I’d like to read your manuscript,” and I visited him in his adobe casita on a ranch outside of Santa Fe, and saw my “great novel” spread on his kitchen table, looking like a rabbit had just been slaughtered on top of my 250 page work — there was that much red ink scrawled on every page — that I discovered my new friend was also the Edward Parone. Maybe it’s California’s diversity of warm-sand beaches to cold rocky beaches, to oak and redwood covered hills that look like how I’d imagine the original Garden of Eden to be, a stark contrast to California’s scalding hot deserts. California’s natural diversity continues with rich farmlands and majestic mountains that capture winter’s snow that eventually feeds California’s rivers as they meander to the Pacific Ocean. It’s a perfect world. Or it was. Like my aging body, California’s environment shows the wear and tear of human activity. But for me, for now, I’m grateful for what it has given me in my search for self. I am every woman and man who has sailed through life’s ports with anguished tales, tragic deaths, nightmares, verbal and physical abuse, lost opportunity, abandonment, and complete spiritual collapse. I am not a celebrity. I am not famous. I’m a California girl saved by the sun, the sea and spirit. Some whispered that my fate was sealed. They predicted failure, destitution, alcoholism, or addiction. As a mother, I heard the whispers that my daughters would run the back alleys, or probably bear their own children before they turned thirteen. These tales probably came from my heritage: the daughter of the son from a small-time Irish crime family; and the daughter of a woman who preferred drink over family privilege — a blend that probably brought on my mother’s untimely death, and the ugly speculation as to what caused her death. The family gossips were bad fortune tellers, however. One daughter is now a respected attorney, and the other is a celebrity chef. Those cousins, aunts and uncles thought that I didn’t hear them. Not only did I hear their dreadful conversations about me when I was still a child, but I saw their gossip circles. I watched them from above the madness. You see, as a child, I became the SS Charmaine, and I could embark like an unleashed balloon. Above the chaos, the furniture and the people in it, an unseen part of me surged skyward from my body. When it seemed as though I could touch the ceiling, I’d push my invisible back against it, with my arms spread wide like a bird. It’s true. When chaos reigned, I mentally left the room and watched the goings-on from above — completely outside of my body. Sometimes I laughed out loud from their absurdities. Grownups did look funny from that perspective. It was a problem, however. When asked, “What’s so goddamned funny?” I never had an acceptable answer. And possibly worse, was when a nun asked, “Charmaine, are you even here in the room?” That time I crash landed back into my wooden desk and pretended that I was really there all along. But I wasn’t. Oh be assured, the odds on those dire forecasts for my soul weighed against me like gale force winds pushing a derelict boat toward a craggy rock shore. After all I was unintended flotsam from the moment I was conceived out of marriage. I bounced from one rotting dock to the other, and then floated thru a series of sinking relationships. Yep. I should’ve sunk like the Andrea Doria did in 1956. Instead, I navigated my way through turbulent and dangerous seas—a willful captain of my own ship. Strength imbued me when I imagined riding my fanciful Palomino horse through the Mojave Desert; or when I let the Pacific Ocean lift my body and then abandoned my will to the cresting wave that propelled me back to the beach; or when the holy quiet of a candle-lit church embraced me and I sensed power outside of me, like a battalion of angels wrapping their wings around my sad heart. Angels. Yes, God bless the angels, both human and otherwise. They, along with the blessing of being born a California girl, helped me sail beyond each toxic port. When I catch a glimpse of my reflection on calm ocean waters that were unnavigable waves the day before, and this gray-haired, plump mermaid stares back at me, I wonder what magic surrounded and protected me from the hungry sharks that once circled me. What brings me inner peace? Why am I not like others who were crushed by life’s storms and now demand entitlement and special treatment? My journey begins in the City of Angels, through the scalding Mojave Desert, along the beaches of California Highway 1, to the Rocky Mountains and back. Now I wake up to the blue Pacific Ocean. It hums to me all day until it is time to let the roar of the night tides rushing to shore sing me to sleep. Healing comes in strange ways. For me, it was cancer. The mystical light returned. I rediscovered my precious angels and released the devils with each daily treatment beneath a cold, gray linear accelerator that forced radiation into my body. I felt the light. I felt the power. I learned to trust again. I learned that I am loved. I learned that my “ways” are good ways. I learned that I’m blessed to be a California girl. So now I share my turbulent voyage with the hope that it will help bring vision and well-being to your own soul while peeking through the porthole of the SS Charmaine. What is A California Girl? Did we know that we were cultural icons? I didn’t–not until I crossed the golden state’s boundaries. When I searched the internet with the question, What is a California girl? WikiHow listed ten ways to identify a California girl. 1) California girl fashion. Pick your style–surf, hippy, office chic and everything in between. It’s a sophisticated casual style. 2) Outdoors & often. Hike, bike, ski, snowboard, run, skate, swim, surf, beach volleyball, and garden. 4) Community participation. We vote in elections as soon as we’re old enough. Like me, many write for our local newspaper, volunteer for a cause, and encourage friends and neighbors to do the same. 6) Go-getters. Californians give it their all whether it’s aiming for the director’s chair, or a dream of being CEO someday. 7) Environmental friendly lifestyle. Recycle, go green, use less energy, ride bikes. Disclaimer: Californians do spend a lot of time sitting in traffic, but individually, many take the opportunities they have to cut down on waste in its various guises. Visit my YouTube piece,”Plastics: Choking the Seas,” for a personal sample. 10) Friendly and approachable. “If New Yorkers have a reputation for being standoffish, Californians are the other way around.” When asked we give directions help out, and smile. Rilda Copeland with daughter Osa, granddaughter Jean, and son-in-law Arthur Hughes on Venice Beach. Rilda’s long fingers carefully packed her sketch pad and Paris-imported brushes and paints into a leather case as the sun slipped from darkness to light over Angeleno Heights – a fashionable suburban neighborhood in the hills above busy downtown Los Angeles. 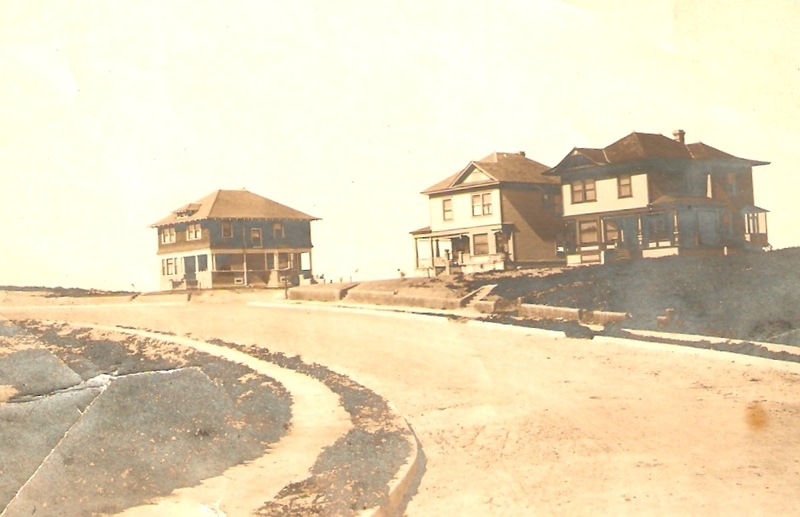 Rilda’s new home, still under construction, overlooked the tranquil Echo Lake and Park on this warm fall day in 1903. It was another one of Matthew’s projects. Matthew, a handsome man well-documented in Colorado history books, pioneered Silverton, Co in its early days. Rilda’s father, a near 7-foot tall man, and called “the patriarch of Silverton’s largest early families,” by historian Allan Nossaman, mentored the aspiring land developer/politician, Matthew E. Copeland. Matt, as he was better known, brought his talents to Los Angeles, along with his wife and son in 1883. Rilda grasped the elephant seal-oiled reins as she climbed into the buggy. She secured her leather case in the box behind her. “I’ll be back before the sun goes down,” she promised. “Git up now,” Rilda commanded the gaited horse and began her weekly trek to the Hollywood Hills where she honed her art under the tutelage of a Hollywood silent film set artist. Art lessons were the one thing she had promised herself when the young family left the winter-frozen, silver-depleted Silverton high country. Matt watched the buggy disappear where Kensington Road bent. He walked to his office —a shed built on the hillside—mumbling, “Damned independent woman. Must be the California sun giving her such big ideas.” Warm Santa Ana winds whipped through the hills. Meanwhile, Rilda and Matt’s second child, their Los Angeles born daughter, named Osa, made plans as chairwoman for her Los Angeles High School Halloween party. Matt had just a few months left to live. 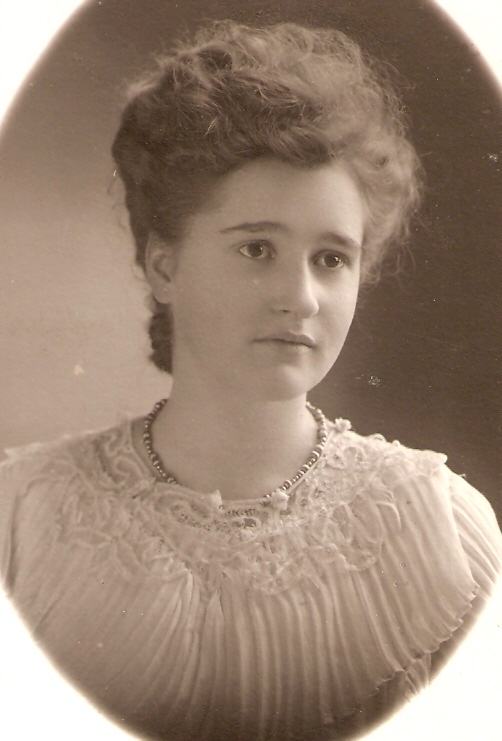 Rilda Copeland, my great-grandmother, is the first in my line of ancestors who fashioned the mythical California girl. She was independent and creative. Her lineage stretched back to 1637 in Virginia, which likely fueled her new found freedom under California’s legendary sun. Kensington Drive home (left) in Angeleno Heights development by Matthew Copeland. Forty-four years later this would be my home—one that would haunt my dreams for most of my life. Inventive, Rilda kept the family funds alive. Fortunately, Angeleno Heights was a popular location for the burgeoning film industry. Chase scenes were often filmed along the sloping Kensington Road. Angeleno Heights was so popular that both Mary Pickford and Gloria Swanson lived in the neighborhood. Rilda capitalized on her location and either rented out the home for films or fed hungry crews for profit. She could also rent out a room or two as needed. Osa Copeland Hughes. 1906 Los Angeles High School senior photo. Rilda ordered her silver polished–much of it mined and crafted from Matt’s Silverton silver mine claims. The walnut dining table was set with Rilda’s personally hand-painted china. Osa was properly presented that Spring evening in the home her father had promised, but never lived to see. But like most Californians, these early California girl ancestors were blasé about the celebrities and glitz. There was the beach, and that’s what Osa wanted. So, shortly after the birth of their first of four children, Jean, Arthur bought a Venice Beach bungalow in the new Venice Beach canal development, for weekend and holiday outings. It was a nice getaway from living in the city house that Matt Copeland built for his family to keep forever. 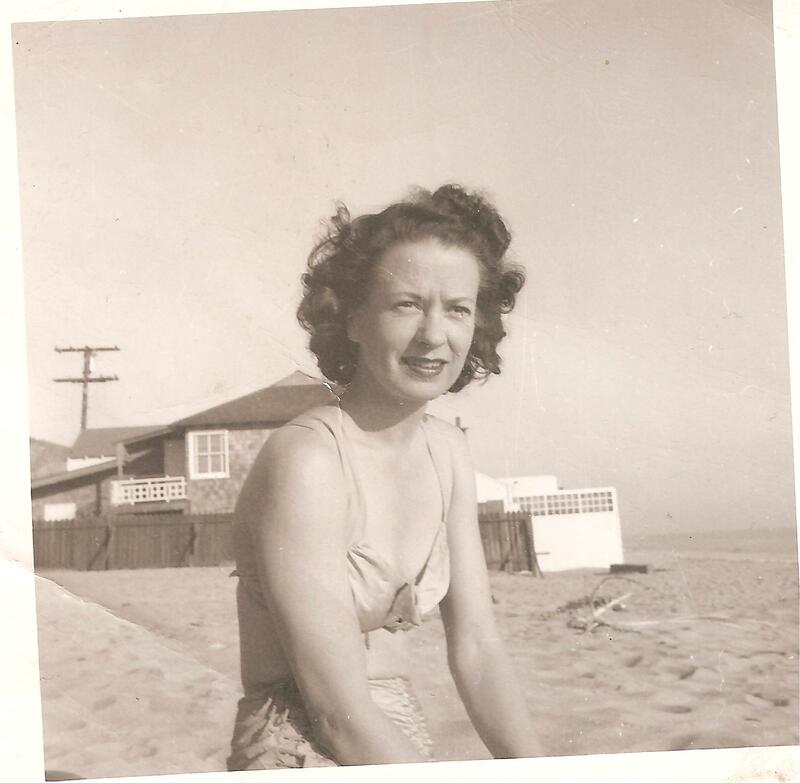 Jean Hughes Haley, Charmaine’s mother, on Malibu beach. Jean spent her youth on the beach with blond streaks in her hair and stars in her eyes. Like her grandmother and her mother, she played piano. Pshaw on the classics. It was eight-to-the-bar for Jean. Jean also loved to tell stories and write. Jean wasn’t into the rules. She loved shopping and stylish clothes. She also loved a good cocktail more often than not. Jean, the family wild-child, was my mother.